How WONDERFUL is this! You made my day, thank you. Congratulations on getting the Tao of the Zombie Chicken! Congratulations! You deserve it! Thank you so much for thinking of me. You rock. Congrats on the award! 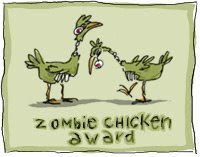 This is one of my favorites going around--who would have thought, a zombie chicken award! Also great blogs you've included.